Persistent reservations support – As an iSCSI target LUN can be accessed from multiple initiators concurrently, such as in a high-availability cluster or shared-storage flesystem, a means by which to prevent initiator I/O clashes has to be implemented. 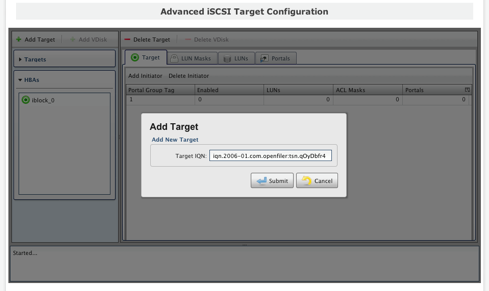 The basic iSCSI target implementation in Openfler supports SCSI RESERVE/RELEASE. This is used in environments where a dedicated lock is required on the I/O target – a LUN in this instance – from multiple initiators performing I/O concurrently. While most legacy applications can function using the RESERVE/RELEASE commands, some newer applications, notably Windows 2008 cluster, require SPC(SCSI Primary Command)-3 Persistent Reservation (PR) commands to function properly. Openfler iSCSI SAN-4-V will honor initiator PR commands where necessary.